Prime Classica Adult Cat Food is a perfect balanced diet formulated to meet the nutrition requirement of both short hair and long hair cats in order to promote the healthy living cats. 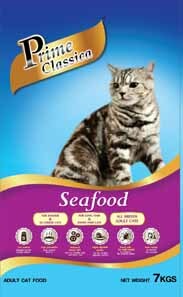 Prime Classica Adult Cat Food is formulated by understanding the nature of the cats then come out with the formula to ease the digestive system by using the highly digestible protein and enriched with the vitamins and minerals. Prime Classica Adult Cat Food is the FLUTD formula to reduce the risk of Feline Lower Urinary Tract Disease.